This is undoubtedly one of the most famous dish in Singapore. This is considered as one of the two national dishes, the other one being chilli crab which is just as popular. When I have time to spare, I love recreating this dish. It's not that difficult to make, however, it is rather time consuming. The chicken are almost gently poached in a pot of water together with spring onions, garlic and ginger. This gave it a subtle fragrance and velvety smooth tender texture which just melt in your mouth. The chicken are then dressed with a mixture of soy sauce and sesame oil. The stock made from poaching the chicken are then used to cooked the rice which is full of the chicken goodness...mmmmm. Last but not least, is the unique piquant chilli sauce. Some might say that this actually make the dish, which is kind of true in a way, as I simply cannot imaging having this dish without the sauce. The sauce is simply a mixture of fresh chillies, garlic, ginger and a touch of the chicken stock and yet these simple ingredients create a magical sauce. I always try to make a big batch and keep them in the fridge as this is definitely better than any shop bought chilli sauce and it takes less than a few minutes to prepare. Bring a large pan of water to the boil, enough to submerge the whole chicken. Meanwhile rub the chicken with salt. Gently bruised the ginger by pressing it with the flat side of the knife . This helps release the flavour. Place the ginger and garlic inside the cavity of the chicken, together with the spring onions or onion. Place the chicken into the boiling water, cover with a lid and bring back to the boil and immediately turn off the heat. Leave the chicken covered in the pan for 15 minutes. Turn the heat back on and bring to the boil again and turn off the heat and rest the chicken for another 15 minutes in the pan covered. Repeat this process twice and then removed and leave to rest until cool enough to handle. To serve, carved the chicken as normal and arrange on a plate. Drizzle with a mixture of soy sauce and sesame oil. In a pan, heat up the oil and gently fry the garlic and ginger, making sure not to brown them. Stir in the rice and fry for a minute. Add the chicken stock and cook over a medium heat without covering for about 10 minutes. Reduced the heat to its lowest and cover with a lid. Cook for a further 10 minutes until all liquid is absorbed and the rice is fluffy and tender. Remove the ginger and garlic and serve. Put all ingredients into a blender and pulse into a paste. Season with salt to taste. Due to the nature of my job, every now and then I will have to do nightshifts. And this week was the launch of Christmas window display and that means one of those much dreaded nightshift. I've decided to prepare some delicious treats for my friends in work and this is Jonny, my friend in work's favourite dish. 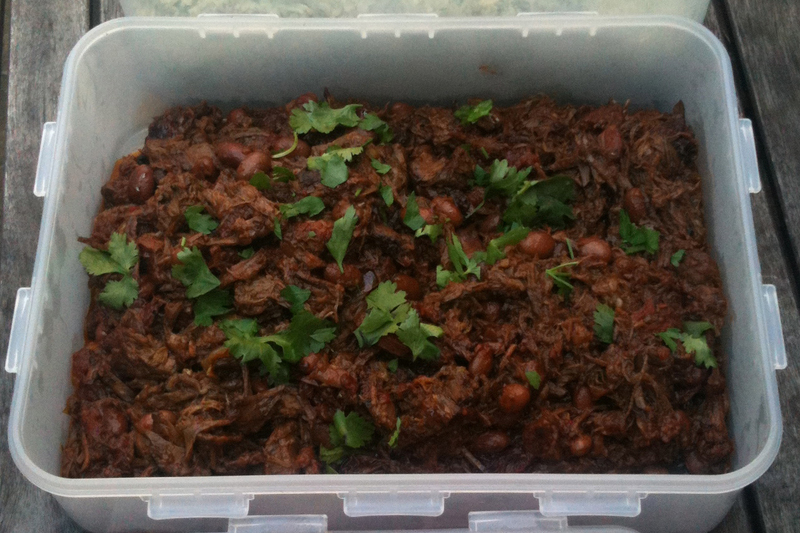 Unlike the normal chile which is made using minced beef, this is made with proper braising steak. The steak are first seared and then place in a casserole with the rest of the ingredients and put in a preheated oven and cooked for at least 3 hours. The pieces of steak are then removed and shredded using two forks alá Peking Duck style. This produced a really delicious and much better textured chile which will put the usual common chile con carne to shame. The addition of chipotle chillies which is a mexican smoked dried japapeño chilli gives it a rich smoky flavour. And due the the request of all my friends who've tried it, this is the recipe for this sumptuous chile dish. Preaheat the oven to 120°C or gas mark 1. Add the chipotles en adobo chipotle chillies or paprika, onion and garlic into blender and pulse until finely chopped. Heat some olive oil in a large casserole and sear the meat on all sides until golden. Set to one side and then brown the chorizo in the same casserole. Add the chopped chipotle, onion and garlic mixture, spices and herbs and cook until soft, for about 4-5 minutes. season with salt and pepper, tobacco sauce and add the vinegar, tomatoes, ketchup and sugar. Put all the steak back into the pot with 400ml of water (or red wine for a richer flavour) until the meat are well covered with liquid, bring up to a simmer and the covered with a lid and cook in the oven for 2 hours. Add the beans and then pop it back into the oven and cook for another hour. Just before serving, gently take the meat out of the casserole and shreds with a pair of forks. Return to the casserole together with a handful of chopped fresh coriander. Preheat the oven to 190°C or gas mark 6. Add the onion, ginger, garlic, chillies, turmeric, tomato purée into a blender and blitz into a paste. Heat up some olive oil in a pan and sauté the red pepper for a couple of minutes. Add the chopped paste and cooked for another 5-6 minutes. Add the cooked rice and mix well. Season with salt and pepper. Pour the rice mixture onto a ovenproof dish and cover with foil. Place in the oven and baked for 25-30 minutes.